View of Philadelphia from City Hall Tower. Title: View of Philadelphia from City Hall Tower. 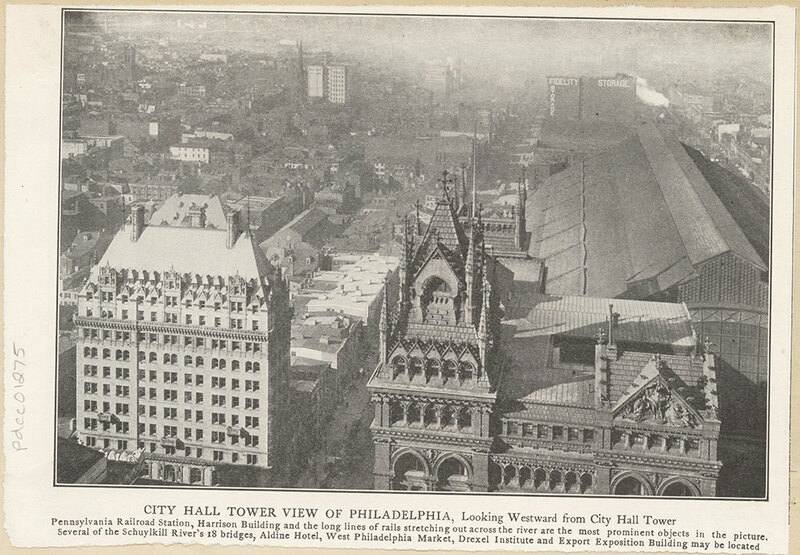 Additional Title: City Hall Tower view of Philadelphia, Looking Westward from City Hall Tower. Halftone reproduction of photograph looking westward from City Hall Tower. From King's View of Philadelphia. Published by Moses King, New York. Copyright, 1900 by Moses King. Caption reads: Pennsylvania Railroad Station, Harrison Building and the long lines of rails stretching out across the river are the most prominent objects in the picture. Several of the Schuylkill River's 18 bridges, Aldine Hotel, West Philadelphia Market, Drexel Institute and Export Exposition Building may be located.